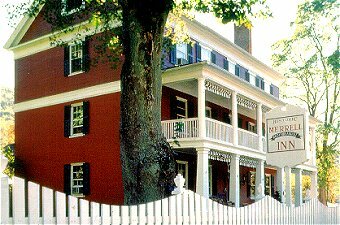 One of New England's most historic Bed and Breakfast inns, found on the National Register of Historic Places. The Inn is located in the heart of the Berkshire Recreational and Cultural area and just a mile from Norman Rockwell's beloved town of Stockbridge. The Inn is located along the Housatonic River on two acres of park like grounds. As a result of its quality the Inn has been given a three star rating by Mobil Travel Guides. All rooms have private bath, television and telephones. A full breakfast of each guest's choice is served at tables for two in the historic old Keeping Room. This and other Stockbridge Bed and Breakfast Inns can be found here in The Register.